Where do I get a German Shepherd Puppy? The GSDCO does not recommend breeders other than offering information on the availability of puppies bred by club members. We suggest that you research all breeders carefully to find one that suits your needs. Even in the best bred litters, not all puppies are suitable for all buyers. It is in your best interest, and the best interest of your future puppy, to become familiar with the breeder and the dogs produced by that person. Adding a puppy to your family requires serious contemplation. The roster lists the members of the club and we encourage you to contact them for more information. We also encourage you to come to club events to become more familiar with the breed. 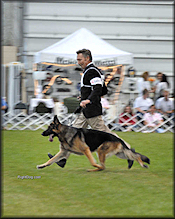 Getting a German Shepherd Dog requires a commitment to training, good care and owner involvement. GSDs need owners who will interact. They need an outlet for their intelligence and energy. Puppies need housebreaking and house "proofing"
Puppies will go through adolescence -- not much different from the two legged teens! Adults have previous life experiences - good and bad. Where do I take my dog for training? There are many trainers available in the Portland Metro area. Consult your breeder, ask friends who have attended classes, go watch the classes. Much of your success will be determined by your relationship with the trainer -- take the time to check it out. Depending on the circumstances, you may elect either joining a class or doing private training. If you are starting with a puppy, limit the exercise to what the puppy will willingly do without stress. Do not allow the pup to jump off ledges or jump into the air as their immature bones and joints are not yet equipped to handle the stresses. Keep the pup lean and fit and allow for lots of rest periods and he will grow up to be a healthy adult. Adults can handle a lot of exercise as long as they are fit. If your dog is out of condition, first take him to the vet for a check up. Then put him on an exercise program. A healthy adult will be able to jog or walk as long and far as you can. Other good forms of exercise are playing ball and swimming. There are as many answers to that question as there are dog owners! Check with your breeder as s/he will be able to tell you what works and what this dog has been eating. When in doubt, check with your vet. There are many good quality dog foods available. Nutritional requirements depend on the dogs age, condition, activity level, and health. Like most other medium to large sized dog breeds, hip dysplasia is a problem in the breed. There are many influencing factors and responsible breeders will do their best to breed sound, healthy dogs. Responsible breeders will also provide a hip and health guarantee for your protection. Check our "Links" page for a link to the OFA - the certifying body in this country, for more information regarding dysplasia. Do I have to own a GSD to join the club? No, we welcome all people interested in this fine breed. We encourage education BEFORE getting a German Shepherd Dog to make your dog owning experience more fullfilling. There are lots of things to do even if you do not now have a dog. There are many resources available by checking the web. Here are links to some good breed information.